Growth5 Blog: Creativity Crisis in America? 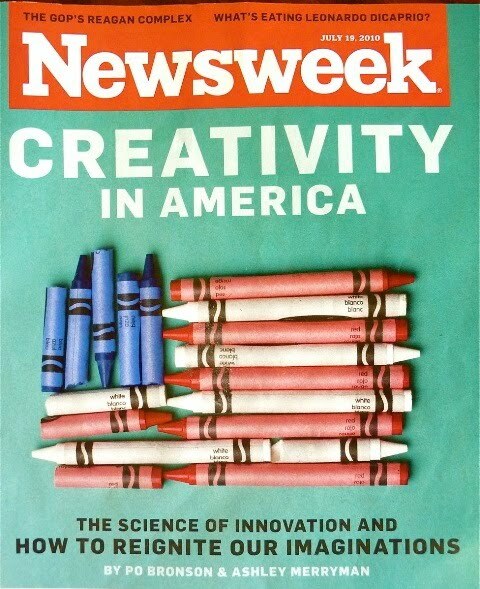 Newsweek recently published this article: The Creativity Crisis. 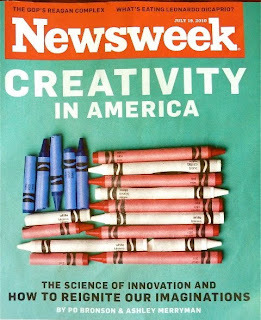 The article covers the issue of creativity in America being on the decline, what went wrong and how can the problem be fixed. Co-author of the article, Ashley Merryman was on Charlie Rose recently, you can check out her segment here. 1. "The accepted definition of creativity is production of something original and useful... There is never one right answer. To be creative requires divergent thinking (generating many unique ideas) and then convergent thinking (combining those ideas into the best result)." 2. Over 50 years of testing children for creativity, "the correlation to lifetime creative accomplishment was more than three times stronger for childhood creativity than childhood IQ." 3. Traditionally, IQ tests go up 10 points in each generation. Enriched environments are making kids smarter. However, with creativity a reverse trend has been identified. American creativity scores are falling. 4. "The potential consequences are sweeping. The necessity of human ingenuity is undisputed. A recent IBM poll of 1,500 CEOs identified creativity as the No. 1 “leadership competency” of the future." 5. There is no concrete theory as to why creativity is declining. A couple places to start looking: a) how much mind-numbing tv is being watched per day and b) the lack of creativity development in our schools. 6. Around the world creativity development is being made a priority. -In England, curricula has been revamped to emphasize idea generation. -The EU designated 2009 the "European Year of Creativity and Innovation." -China is extinguishing the "drill and kill" teaching style. Chinese schools are adopting a problem-based learning approach. 7. "The argument that we can’t teach creativity because kids already have too much to learn is a false trade-off. Creativity isn’t about freedom from concrete facts. Rather, fact-finding and deep research are vital stages in the creative process. Scholars argue that current curriculum standards can still be met, if taught in a different way." 8. Creativity does not just come from the right side of the brain. It is a combination of both sides. "When you try to solve a problem, you begin by concentrating on obvious facts and familiar solutions, to see if the answer lies there. This is a mostly left-brain stage of attack. If the answer doesn’t come, the right and left hemispheres of the brain activate together. Neural networks on the right side scan remote memories that could be vaguely relevant. A wide range of distant information that is normally tuned out becomes available to the left hemisphere, which searches for unseen patterns, alternative meanings, and high-level abstractions. Having glimpsed such a connection, the left brain must quickly lock in on it before it escapes. The attention system must radically reverse gears, going from defocused attention to extremely focused attention. In a flash, the brain pulls together these disparate shreds of thought and binds them into a new single idea that enters consciousness. This is the “aha!” moment of insight, often followed by a spark of pleasure as the brain recognizes the novelty of what it’s come up with." 9. "Creativity requires constant shifting, blender pulses of both divergent thinking and convergent thinking, to combine new information with old and forgotten ideas. Highly creative people are very good at marshaling their brains into bilateral mode, and the more creative they are, the more they dual-activate." 10. Is creativity learnable? "University of New Mexico neuroscientist Rex Jung has concluded that those who diligently practice creative activities learn to recruit their brains’ creative networks quicker and better. A lifetime of consistent habits gradually changes the neurological pattern." Creativity can be practiced, over time it becomes more natural and efficient. 11. "The good news is that creativity training that aligns with the new science works surprisingly well. The University of Oklahoma, the University of Georgia, and Taiwan’s National Chengchi University each independently conducted a large-scale analysis of such programs. All three teams of scholars concluded that creativity training can have a strong effect. “Creativity can be taught,” says James C. Kaufman, professor at California State University, San Bernardino." 12. For children, "in the space between anxiety and boredom was where creativity flourished." 13. "those who do better in both problem-finding and problem-solving have better relationships. They are more able to handle stress and overcome the bumps life throws in their way. A similar study of 1,500 middle-schoolers found that those high in creative self-efficacy had more confidence about their future and ability to succeed. They were sure that their ability to come up with alternatives would aid them, no matter what problems would arise." 14. "Creativity has always been prized in American society, but it’s never really been understood. While our creativity scores decline unchecked, the current national strategy for creativity consists of little more than praying for a Greek muse to drop by our houses. The problems we face now, and in the future, simply demand that we do more than just hope for inspiration to strike. Fortunately, the science can help: we know the steps to lead that elusive muse right to our doors." A son asked his father why Sacramento was the state capital of California, not San Francisco or Los Angeles... the father turned the question back on his son, encouraging him to come up with as many explanations as he could think of... stretching both the divergent and convergent thinking muscles. This creativity practice seems far more effective than just supplying a concrete answer that is to be memorized by the students as a lot of our schools are doing today. How many thinking muscles would've been used by his son if the father simply answered the question about Sacramento with, "gold, mostly." It's also helpful when you don't know the answer to your kids' questions... it's creativity practice time everyone!